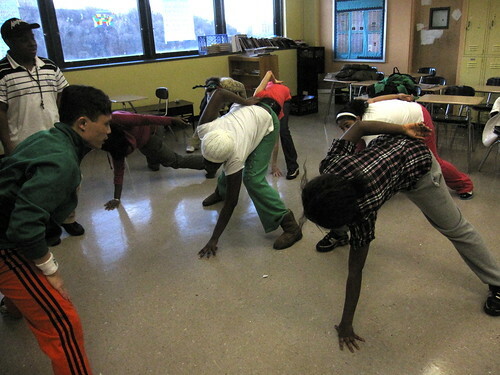 Yesterday I had the pleasure of teaching a hip-hop workshop to a group of Global Kids teens in the Bronx, which was a unique challenge for me for a number of reasons. Here's how it went. Global Kids has been running programs at the middle school IS229 for the past couple of years, exposing these young people to new ideas and issues and ways of looking at the world. I was asked by GK trainers Joliz and Brian to come out and lead a workshop on hip-hop culture and breaking a couple of months ago, and we finally got a chance to try it out. We began by watching the first few minutes of the excellent documentary Planet B-boy, which has an extremely concise and entertaining explication of the history of hip-hop and b-boying. Then we had an animated discussion about the four elements of hip-hop culture: MCing, DJing, graffiti and b-boying. I asked the teens where hip-hop comes from. "North America," one of them answered, hesistantly. "The East Coast," another offered. "Close," I replied. "Very close actually. Hip-hop was born just a couple of blocks from here, at 1520 Sedgwick Avenue. On August 11, 1972, DJ Cool Herc had a historic party in the rec center of his building at that address. And many people say that's where the elements of hip-hop culture first came together." "1502 Sedgwick? That's MY building!" one of the students exclaimed. I could see that this impressed them that something so globally impactful could come out of the South Bronx. 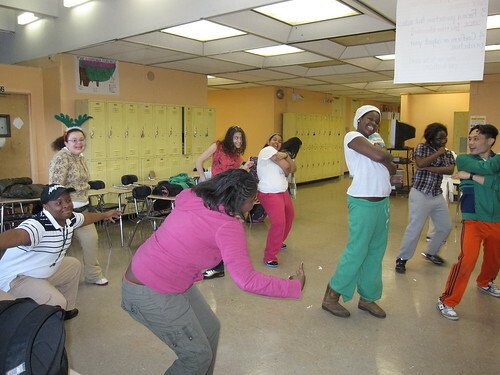 In preparation for the dancing portion of the workshop, we did a warmup exercise. I was going to lead it, but the kids all started shouting out their own favorite stretches. So we ended up just doing a combination of various warmups that they knew, which was awesome. Now that we were stretched out and warmed up, it was time to dance! I taught the basic toprock, and explained the purpose of toprocking as a way of prepping for floorwork, getting people out of the way, and getting your body ready to attack the floor. We drilled this a couple of times, and then moved on to a couple more basic toprock steps. We did a short toprock combination and drilled it a few times, ending with a spin and a pose. Then we performed it a couple more times to music. The kids are all doing their own poses in this shot. So cute! Then I did a basic intro to floorwork, showing them a three-step. This was pretty challenging for most of them, but they all tried, which was important. Then we were quickly running out the clock in this short workshop, so we did short share out about what everyone learned. After class, I demoed a few moves for the kids and helped one of the boys work on his headstand. Then someone found the song "It Takes Two" by Rob Base on my computer, and everyone started rapping along and dancing to this hip-hop classic. It was hilarious. For myself, doing this workshop was a particular challenge for a number of reasons. I don't consider myself a very good dance instructor under the best of circumstances. I'm just not good at breaking down steps that I know in ways that are helpful to someone who has never done them before. And teaching a roomful of middle school kids was particularly challenging since I have no idea what a 13-year old girl or boy is capable of. Frankly, I was intimidated by the idea of teaching at the Bronx school, as opposed to doing it in the more familiar turf of the Global Kids headquarters. But these kids were very game and fun to work with. Joliz and Brian were super supportive and accommodating throughout the process. And it was a good experience for me to see first hand the environment our teens are learning and growing up within. I learned it was possible for me to lead a workshop with Global Kids teens successfully. The most satisfying bits were when the kids surprised themselves about what they could do. "I got it! I got it!" one of the girls shouted, when she mastered the toprock routine I taught. For the next time, if there is a next time, I need to plan for what to do if there are a subset of kids who aren't ready for floorwork, or are just less advanced than the other kids. Ideally, I would do this with another dancer, who could take aside the kids who were not as confident doing the floorwork and teach them an alternative combo or routine. And then we could bring it all together at the end. Good!! even I wanna learn the hip hop dance. can you teach me.